At the local Renn-fair they have a no weapons policy. including wooden ones. they still allow some thing in that could be weapons, staves and such. I have however been slowly working on curtailing that rule, not for myself necessarily, I have customers that want the look of a weapon to go with their costumes. This is one of my favorite customers, with his 48ish ounce Hammerstien. the first weapon shaped mug I made. After a couple years or that being allowed I decided to try the other ones. The Mace/club shaped one is my highest capacity mug to date, around 64 oz. The red hammer is in the unfinished state, I forgot to get a completed picture of it. it holds around 30pz. This season I am introducing 2 new designs The Axe’nstein, and Sword’nstien. I know the names need work. The sword shown in the picture is the prototype, it holds roughly 18 oz, and in case you are wondering you drink from the bottom of the handle. The second new design is the axe. This one is a one off since I put brass in the ‘blades’. So far the swords and hammers seem to be big sellers. -- I said I was a Genius, I never said I was smart. There’s always around the rules isn’t there. I’m sure you have been asked many times…how do you seal the inside? 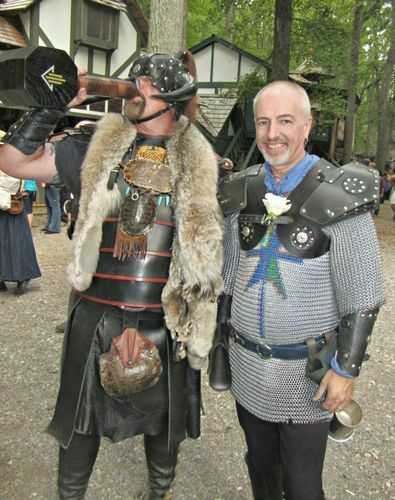 The Ohio Ren-Fest has a similar policy – weapons are allowed as long as they are securely bound into their scabbards with no way to easily or quickly undo the bindings. These would be hot selling items around here. Thanks for posting. Great looking weapons! Or should I say, steins! Hawaiilad- I use a Bar top epoxy to seal them, its aquarium safe too, so safe for drinnks. leafherder- I may have to look into visiting the Ohio faire, I’ve been looking for ones that are relatively close to expand into. Arrow shots, that’s pretty clever, I may have to try that out. Thank you all for the comments and views. Pretty sweet. I am a fan of weaponized weapons though. But weapons and beer is one of the greatest combinations. I had pondered doing a buckler some how. but best idea I have for it is to make it into a flask and shot glass tote of sorts. Have the back open up and on one side have a few flasks, custom fit to the bucklers shape of course, and on the other side a few slim shot glasses. Go for it bud. By the way. Nice beard. I would be jealous but mines bigger. Ok I’m lying.